Fried chicken and bread are among many items that grace the table at Bea's Restaurant. The restaurant offered meals for a dollar to celebrate its 60th anniversary. 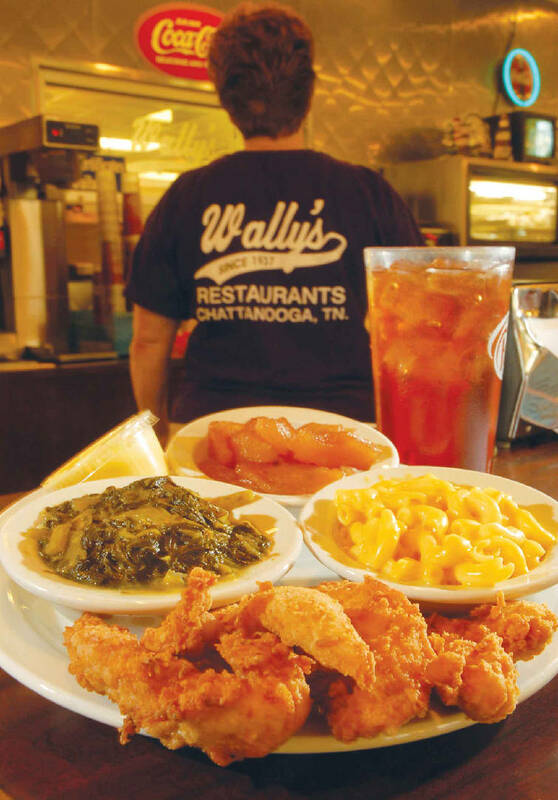 Wally's Restaurant, on McCallie Avenue, offers chicken strips with macaroni and cheese, turnip greens, baked apples and iced tea. In January 2018, Zarzour's Cafe on Rossville Avenue will turn 100 years old. A Chattanooga landmark, the little family restaurant has survived two world wars, the Great Depression, and four generations of family ownership. Established by Charles Abraham Zarzour, a Lebanese immigrant, and located off Main Street in what is now called South Chattanooga, Zarzour's not only survives but flourishes. After his wife died, Zarzour is said to have raised his five children in the living quarters of the little cafe. In 2016, Southern Living magazine featured a photo spread of Zarzour's in its April edition and crowned the restaurant's signature hamburger Tennessee's best. Zarzour's is one of several legacy restaurants in Chattanooga that have survived 60 years or more of operation. Members of the ownership families of these eateries say a laser focus on customer service, a commitment to traditional Southern cooking and creating a family-like staff environment are what keeps the lights on. Also, when a family's roots are in the restaurant business, it seems to serve as a shock absorber against bumps in the road, the restaurateurs say. "There is a pride in continuing in the family heritage," says Shannon Fuller, co-owner at Zarzour's Cafe. "There's a certain grit in saying, 'I'm not going to be the one that shuts it down.'" To mine the secrets of multi-generational family restaurants we interviewed company leaders at three of the city's most iconic meat-and-three cafes: Zarzour's Cafe; Bea's Restaurant on Dodds Avenue; and Wally's Restaurant on McCallie Avenue and in East Ridge. Claims to fame: The little restaurant is open for lunch 11 a.m. to 2 p.m. weekdays and specializes in burgers and Southern fare such as homemade cornbread, meatloaf and opened-face roast beef sandwiches. The restaurant has been featured in Southern Living, Gourmet magazine and USA Today among other media outlets. What is your business philosophy? "My personal take on the restaurant business is: Know all your regulars by name, what they eat, and what they drink. I ask them about their lives. Being part of the customers' life and being interested in their thoughts is my philosophy of good business." What are the biggest business challenges you face today? "There are so many restaurants opening here (on the South side). Eventually all my customers come back, but it's tough when a new restaurant opens about every two weeks. I just read that the restaurant bubble is about to burst. There's a lot of restaurants having a hard time affording staff. Staff is getting top pay." Are you able to attract new customers? "I've gotten some young blood in here. We were featured in Southern Living as Best Hamburger in Tennessee. Hamburger America has featured us a bunch. The new Taste of the South magazine has featured our meatloaf. We've been in USA Today and Gourmet. I consider it my job to talk about the restaurant (to the press)." Claims to fame: Named for its diminutive original co-owner, 4-foot 11-inch Beatrice Steele, Bea's has been a Chattanooga landmark for generations. Originally designed as a lunch spot for factory laborers, Bea's still features Lazy Susan serving. Many of Steele's original recipes have been the foundation of the menu for 66 years. What, in your opinion, are the keys to Bea's longevity? "I think two things. Our food — that's why people come and eat — and authentic Southern cooking. Every 15 or 20 years we get a new generation of family leadership. What are a few of your most iconic menu items? "Fried chicken, barbecue pork, peach cobbler. We have lot of people who like our slaw and the little new potatoes in cream sauce. We don't do short cuts. We prepare our food fresh every day." How do you cultivate new customers? "Every day we have new people come in. We try to acknowledge new customers, and let them know we appreciate them being here." How important is staff continuity? "I think that's real important. We've got customers who have been eating here 50 or 60 years. We get to know people by name. We have a connection that a lot of places don't. It's genuine. It's not false or superficial." How would you summarize the restaurant's business philosophy? "All of our culture is passed down. We try to treat every customer through the door as if the situation was reversed. You walk in as a stranger and leave as a friend." Claims to fame: The McCallie Avenue location has been a favorite gathering place for local politicos for decades. Chicken strips are a customer favorite, and it's one of the few places you can substitute cobbler for one of your meat-and-three side dishes. What's the secret of Wally's longevity? "Staff. Having good people, and taking care of those people." Who created the company's culture? "(Now-retired) Tony Kennedy, my mentor and step-dad, we are only here because of him, as a result of his legacy and hard work." How do you attract new customers? That's the million-dollar question. We were are facing a new generation, the Millennials, that don't appreciate the country-cooking, meat-and-three meal. Do people like new wrinkles on the menu? They do, but they are very traditional. If I go up a nickle (in price) on something, I hear about it. Our foundation is good people and good food at reasonable prices. Speaking with a friend of mine in another restaurant business model, he says they do good after Christmas because they have more healthy items. I don't think there's anything healthy on our menu. But if you know one thing, and you are good at it, continue to to it. Don't try to change.